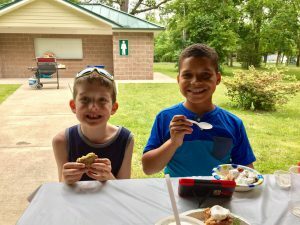 On Sunday June 4, five Franconia Conference congregations (Wellspring, Methacton, Spring Mount, Frederick, and Providence) gathered in Skippack to worship together and have a picnic. Skippack has some historical significance, being the place where Mennonites first settled in Montgomery County. A few centuries later we are still here, seeking to live out a vision of faithful witness to Jesus Christ. In the beautiful surroundings of Hallman’s Grove, tucked within a residential neighborhood just east of the village, I was reminded of the life and Spirit that surrounds us. One’s senses could pick up the sights and sounds of creation as well as a gentle breeze— especially meaningful on this day of Pentecost that was the focal point of our gathering. We celebrated the coming of the Holy Spirit to the first followers of Jesus (Acts 2), and the gifts of the Spirit present among us today. Worship included speaking and singing in different languages, and a recitation of the Lord’s Prayer included nine languages (Spanish, Indonesian, English, German, Greek, Italian, Kannada, French, Vietnamese). 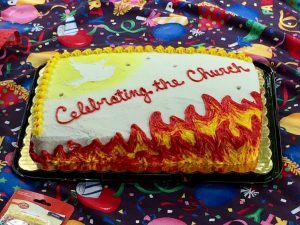 Pastor Sandy Drescher-Lehman of Methacton Mennonite Church presented a children’s story about the birth of the church—complete with birthday cake! —and she and the children led us in a fun birthday song. We prayed for each other, for our pastors, and also for a local food pantry, all of which reminded me of our common mission in central Montgomery County. Our pastors took turns giving a short message about how we have been living out God’s mission and how we are being empowered for ministry by the Spirit. 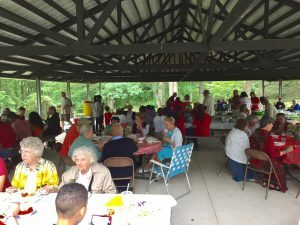 The picnic, organized by members of each church, provided plenty of delicious food and space to build relationships with one another. The event was a team effort among our congregations, and I think we are discovering that we really enjoy working together and are being blessed in our common activities and growing relationships. Despite the small size of our individual congregations, we are noticing that we benefit from diverse membership and from the wisdom of our elder members. We are realizing that our small congregations can be a blessing to our conference and also to our local communities. We have unique gifts to offer, and by the end of our time together I felt energized for how we might continue to share the love and light of Christ together.